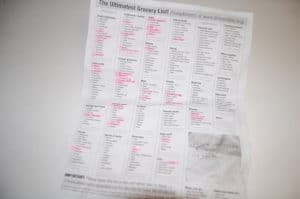 I’ve been using this printable grocery list for a few years and it comes in handy when we are planning out our shopping trips! My husband even started using it recently! 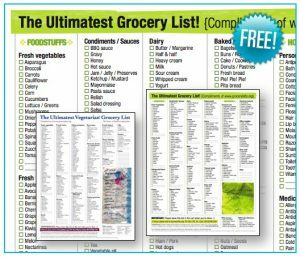 Print The Ultimatest Grocery List for FREE, compliments of Grocerylists.org! They also have a Vegetarian list. While you are here, don’t forget to check out the best places to find printable coupons online. After I printed the list, I went through it and highlighted everything I knew I needed. I love how I can just quickly go through the list and highlight what I need (everything is categorized). I think they do that for advertising purposes. I actually didn’t leave mine in the cart! I wouldn’t leave the list because I’d hate for it to blow away and end up as litter. 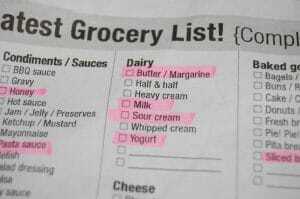 But can I just say I LOVE finding people’s grocery lists left in the cart? It seriously makes my day. It’s like a private little invitation into a stranger’s life. Ha!! That is awesome!! I might just start purposely leaving mine now!! Thanks for the list – I was going to make my list after reading emails – this will make it so much easier! If you laminate it, then you can use a dry erase marker to mark items you need. Just wipe off and reuse. (If you are afraid of accidentally wiping it off then use a wet erase marker). You can find self-laminating pages at office supply stores.